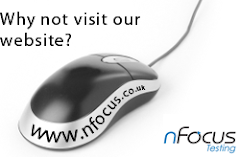 We at nFocus are an independent software and systems testing consultancy (zzzzzzzzzZZZZZZZZ); but more importantly, we are a cluster of people that are passionate and perhaps obsessive about software testing. With this blog, we hope to inform and indeed make sense of the many perplexing issues we come across, and hopefully entertain you in the process. Thanks for taking the time to read our blog, check back again soon! In the mean time feel free to take a look around our site.